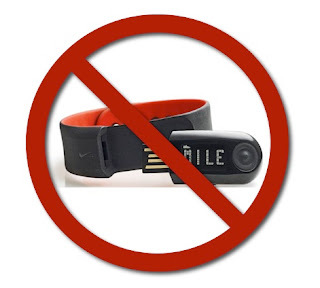 This afternoon I decided to finally end my experiment with the Nike+ Sportband by returning it for a full refund. This was actually Sportband #3, the previous two had displays that failed and the current display just stopped exchanging data. As frustrated as I was with the Sportband I felt a certain loyalty to the device. After all it was with me throughout most of my return to running and it dutifully recorded over 180 runs with useful and accurate information. I had some initial problems with calibration and I called the Nike help line staffed by very engaged people who understood and solved every problem. In the end it came down to a device that didn't meet my needs. The woman who handled my return offered to do it as an exchange saying she knew nothing about the Nike recall and that they were still selling the units. I told her I couldn't continue the insanity and showed her my Garmin 50 saying I've moved on. She rolled her eyes and said "The credit will go to your Visa, have a nice day, next in line!" So now I'm using the Garmin and I think I've figured out how to calibrate the distance despite a less than clear manual and less engaged support from Garmin. The Sportband was slick and the Garmin is sort of bulky. The Nike+ site has lots of fun features, challenges and community boards. The Garmin site has little of that but the data it presents is much better. The Garmin tells me many things as I run while the Sportband only told me a few. I'll miss the Sportband's simplicity but I won't miss the inevitable failure of its display or functionality. I still like Nike but I'll stick to their non-electronic gear from now on. Hey, after all I just bought my wife a pair of Air Zoom Vomeros.